I make a lot of stupid decisions. Like running a marathon. That was stupid. Then, I had the bright idea to run an ultra. Also stupid. So, leave it to me to be more stupid and run and marathon and a half marathon in the same weekend. Okay, maybe I don't think any of those things are stupid. Perhaps I'm a masochist? A stupid masochist. So, the reverse goofy...it's like Disney's Goofy Challenge where runners complete the half on Saturday and the full on Sunday, only I did it in reverse. Why? I don't know. Boredom? Curiosity? Adventure? A little bit of all 3? The two races I decided on were the Abebe Bikila Marathon and the Parks Half Marathon. 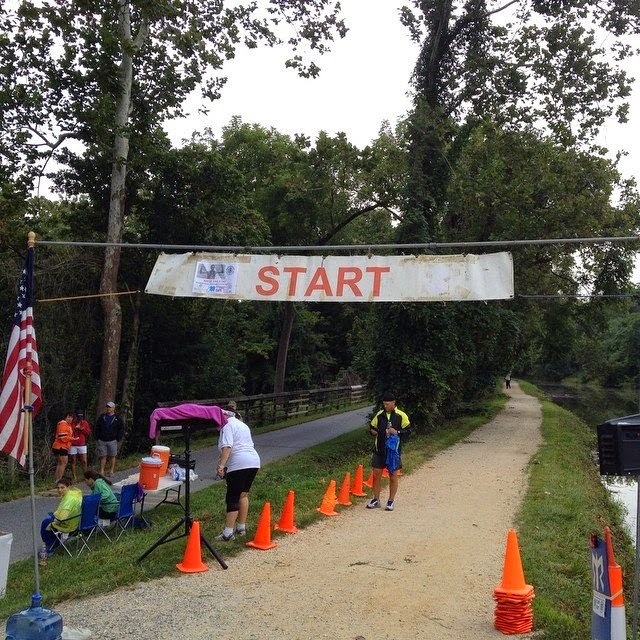 The marathon course was on the C&O Canal towpath; a flat, stone crushed trail that is wedged between the C&O Canal and the Potomac River. The Parks Half was a point-to-course in Maryland that started in Rockville and finished in downtown Bethesda. The marathon set off at 9 under overcast skies. The temperature was pretty good (somewhere in the 70s), but the humidity was high and that was the real killer. I ran around a 9 min/mile pace and didn't plan to stray too far from that. I was aiming for a sub-4, but whether that happened or not didn't really matter to me. I just knew I needed to run easy so that my legs weren't completely toasted for the half. I found a nice rhythm and settled in for the 26 mile journey. Aid stations were abundant and I made sure to stay on top of my hydration. The course was a 6.5 mile out & back [insert fart noises here]. Out & backs are not my favorite and knowing that I would have to do it twice sucked, but whatever. I did my best to appreciate the scenery around me. The C&O Canal carries a lot of history and many of the old canal locks and lock houses are still standing, which is cool to see. Towards the end of the first out & back, a light rain began to fall, not that I minded. I was already drenched in sweat. I finished the first out & back in under two hours and I was feeling good. I decided to up my pace just a touch, but was still being mindful of the next day. However, it was hard to ignore the competitive spirit during a marathon and holding back on my pace was an on-going challenge. In hindsight, it was good I ran this race easy as many runners were suffering from the humidity. In fact, around mile 24 I came across a runner lying on the trail. I stopped to ask him if he was alright and he said he was very dehydrated. 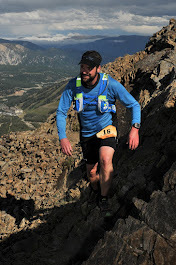 I unfortunately wasn't carrying any water, but he told me some other runners went ahead to the next aid station to tell the volunteers to bring him some. He was very coherent, but a little pale in the face. I asked for his name and told him I would make sure water was on the way. Not five minutes later I saw aid station volunteers running towards me with a gallon of water. I described the runner to them and continued on. I crossed the finish line a few minutes under 4 hours and immediately went into recovery mode. 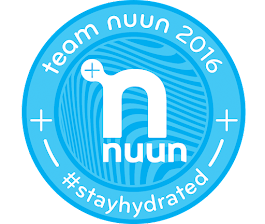 I started stuffing food in my mouth (very cold pizza and a bagel) and pumped my body full of Nuun deliciousness. My legs were pretty stiff, but after a solid stretch session they felt better. After the race I drove straight to the half marathon packet pickup to meet up with my friend Janine who was also running. I was still in my running shorts and when I went to pick up my bib, the check-in volunteer asked me if I had run to the pickup. I told her I didn't and that I had run earlier in the day. She then said, "Well, I hope you didn't run too far that you ruined your race tomorrow." All I could do was chuckle. When I got home, I slipped on my compression socks, propped my legs up, ate, watched college football, and ate some more (I may or may not of eaten and entire bag of Sun Chips). I even indulged myself with a delicious fall beer. Beer has carbs too, you know. I also made sure to get up and move around often to keep my legs loose. With a start time of 7, I was up and at it early for the half. My legs were definitely a bit stiff when I got out of bed, but nothing too crazy. I met up with Janine and her fiance kindly drove us to the start line. The weather was much nicer for the half. The humidity was gone and the temperatures were in the 50s. I was looking forward to this race. Much of the course snakes through some really pretty park land. I wouldn't classify the course as flat or hilly, but it has a few rollers. The sun was just creeping over the horizon when I headed off. I knew my legs would feel better once I started running and after about a mile they came to life. 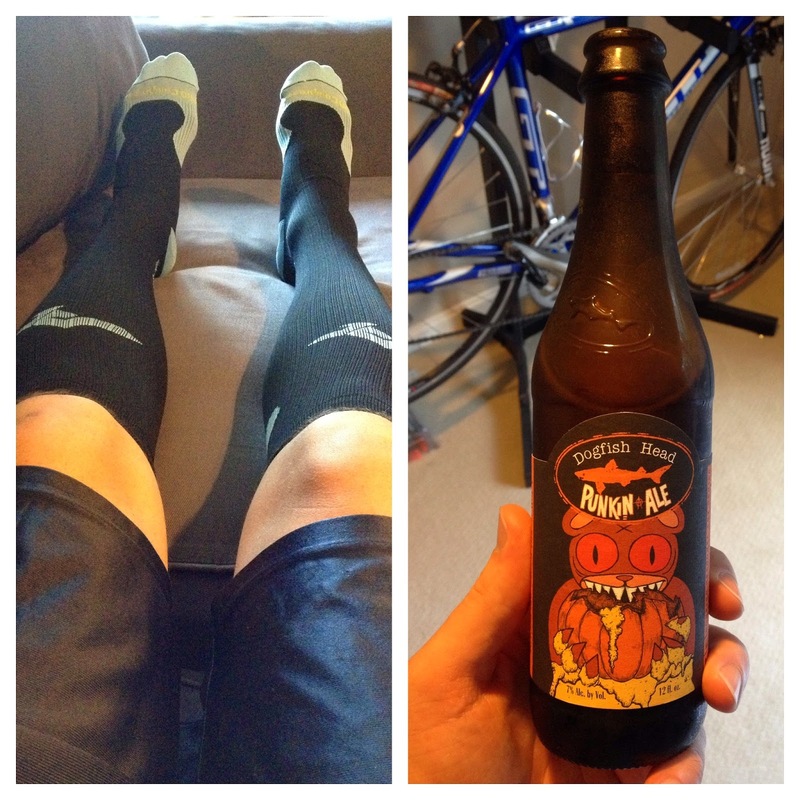 That's not to say my quads/calves weren't yelling at me, cause they were. But, in a way, it felt good. I feel a bit more alive on a run when I'm in a little bit of pain. Remember, I'm a stupid masochist. 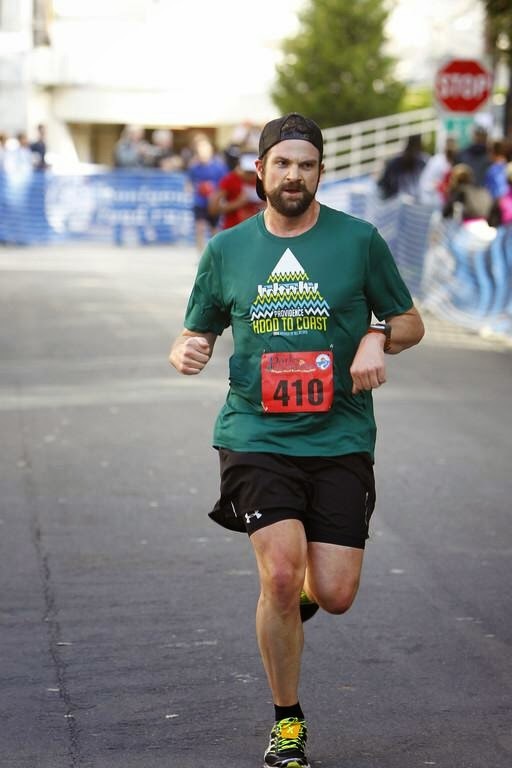 I held myself back a bit during the first half of the race to gauge what amount of effort I could put in. In my head I was thinking that I would run around an 8:30 pace, but as mile 7 clicked off in 8:17, I knew my legs had a bit more life in them. So, I decided to give it a good go for the second half. The last 6 miles were very enjoyable. I was doing what I love and feeling great. The weather was awesome, the birds were chirping, runner camaraderie was high and the course was gorgeous. I sometimes have to pinch myself to remind myself how lucky I am to be able to run. It's so easy to take the gift of running for granted. Finish line in view, I gave it one last burst and completed my 39.3 mile weekend! The reverse goofy was a lot of fun and gave me a good taste of what stage racing would be like. While doing something this stupid might not be for everyone, I encourage you all to find something that presents a challenge and get after it! It keeps running fun and fresh. So proud of you!! You are a rockstar and an inpsiration!! !